Radiographs (X-rays) are extremely helpful for diagnosing and monitoring many medical and surgical conditions. X-rays are useful in examining your pet's bones, lungs, heart, abdomen, oral cavity and other areas of the body. An X-ray can spot a fractured bone, detect tumors, help with the diagnosis of heartworm disease or locate an obstruction or foreign body in your pet's intestine or stomach. When used in conjunction with other diagnostic procedures like ultrasound, X-rays can accurately diagnose problems, making treatment faster and easier for your pet--and your veterinarian. 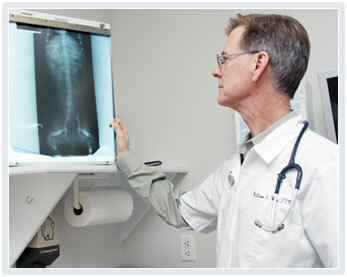 Lakeside Animal Hospital utilizes the latest in digital radiographic technology, which includes rare-earth screen film system for the highest quality and detailed studies. Rare-earth screen is a substance used to intensify the effects of X-ray imaging in order to create greater clarity and detail while also lowering the amount of radiation used to create the image. In severe and complex cases, our partnership with VDIC, a veterinary radiology specialist, allows us to receive timely second opinions. Ultrasound is a pain-free, totally non-invasive technique that uses high-frequency sound waves to produce a real-time image of your pet's internal organs. Often considered more exact than radiographs, ultrasound provides a movie of what is happening inside your pet's body. It is particularly useful in viewing your pet's abdominal organs including the spleen, kidneys, liver, and gallbladder. It can also be used to evaluate heart functions, bladder scans and other areas such as the thyroid glands, testicles and mammary glands. 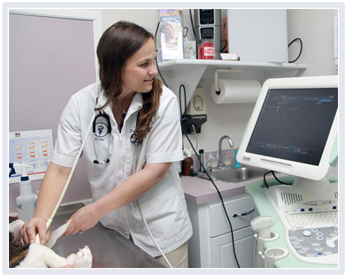 Ultrasound also works well in conjunction with other diagnostic tools and a wide range of diagnostic procedures. For example, if an x-ray shows a lesion on your pet, an ultrasound can determine the origin of the lesion and whether it has spread elsewhere in your pet's body. Using the ultrasound image as a guide, surgical biopsies can be obtained without major surgery and your pet can often go home the same day. Ultrasounds are typically not stressful for your pet and take anywhere from 30 to 60 minutes to perform. Lakeside Animal Hospital uses modern ultrasound technologies and is up-to-date on the latest ultrasound-assisted procedures. In certain complex cases, our use of Tel-Med technologies enables us to email ultrasounds and x-rays to our partners at VDIC in order to gain timely and highly reliable second opinions. An otoscopic examination of your pet’s ears is an important part of your pet’s regular wellness checkups. During your pet’s lifetime, he or she may develop a number of painful and sometimes dangerous conditions in their ears. These can include ear mites, infections, hair balls and other foreign objects lodged in the ear, as well as damage to the ear canal and ear drum. Since early detection of these issues is important to preventing serious illness and hearing loss, your veterinarian will examine your pet’s ears using an otoscope. By looking into the ear with an otoscope, your veterinarian is able to look for signs of infection, ear mites, foreign objects, and any other indications of underlying disease in or around the ear. Your veterinarian is also able to check the health of the ear drum, which can provide important information as to the health of the middle ear. This is where the mechanisms for hearing and balance are located. 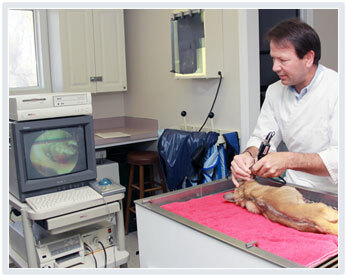 The otoscopic examination takes only a few moments and does not cause any pain or discomfort to your pet. Once completed, your veterinarian will discuss with you the health of your pet’s ears as well as any treatment options if necessary. Your veterinarian will also provide you with information on the signs and symptoms that may indicate an issue with your pet’s ears as well as instructions for proper ear care at home.